This page is written for FX-602P, the best (IMHO) programmable calculator made by CASIO Corp. in 1980's. Please note that this page is a subset of the original Japanese version. 2. I am very sorry, but I can't help to buy someone's FX-603P. (not enough time for shopping, shipping, ... etc) Sorry. New (helpful?) hints for Quiz are added. *Big News* New links, including FX-602P Simulator project are added. Thanks, Martin! alphabet-display in both upper and lower cases. (*1) You need a cassette interface option FA-1 or FA-2. What kind of programming system does it have? Although most other calculators made by CASIO uses BASIC (these calculators are actually called pocket computers), the programming system of FX-602P series is different. Its programming system is much similar to an assmbler. So, especially for those who are familiar with an assembler, it is not hard to understand. You will learn more details in a quick command reference shown below. Do you have a quick command reference? x=F if x is equial to variable F, go to the next command as usual. Otherwise, skip the next command. PAUSE Pause for around 1 sec. ISZ Increment the variable 00 (MR00) and if it is equal to zero, skip the next command. Note: This command is useful for loop control. DSZ Decrement the variable 00 (MR00) and if it is equal to zero, skip the next command. Note: This command is useful for loop control. IND GOTOx Indirect jump. Jump to label of variable x(x=00 to 09). For example, if MR00 is 3, IND GOTO0 means "jump to LBL3." IND GOSUB(0) Indirect subroutine call. Call a subroutine of variable 00 (fixed). For example, if MR00 is 3, IND GOSUB(0) means "GOSUBP3." Are there any brother machines? FX-602P (601P) is based on its brothers FX-501P and FX-502P. FX-50xP has 7-segmented displays and can't show alphabets. It has only 128 ot 256 steps for programming. As a whole, FX-50xP is similar to FX-602P. FX-601P is a cheaper version of FX-602P. The difference between 601P and 602P is that FX-601P has only 128 programming steps and 11 variables. FX-702P is quite different. Its programming language is (simplified) BASIC, though both FX-702P and 602P can use the same cassette interfece FA-1 and FA-2. It seems almost impossible to get FX-602P now. If you are really, really lucky, you may find one in some auction sites. 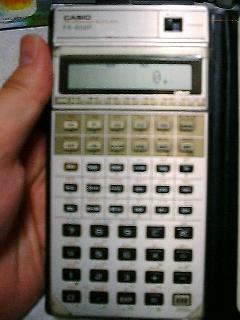 I recommend to try FX-603P instead, which is also a nice calculator and can be still obtained from CASIO (I think). However, FX-603P is no longer on CASIO's home page, too. So it will be getting hard to obtain one in the future. As far as I know, FA-1/FA-2 (cassette interface) and FP-10 (printer) were only options for FX-602P. For FX-603P, FA-6S(cassette/PC interface) and FP-40? (printer) are available. FA-6 is a former version of FA-6S and is not VCCI compatible. Can I change screen contrast? For FX-603P, you can do it with a contrast adjustment dial on the side. However, it seems impossible to change screen contrast of FX-602P easily. According to this page, you may have to adjust an internal potentiometer. If you know a key combination to change screen constrast of FX-602P, please let me know. Put GSBP9 GSBP9 ISZ to P9 and execute P9. How much does MR00 increase? (The answer depends on your machine. Just try.) And can you explain why? Note: If you need more hints, click here. - New! Q.4 What is this program? Can you tell what is this program for? "Error" message is considered as 0. My best record is over 10^15. If you find a better answer, please let me know. You can use the build-in commands x>=0 or x>=F to check "equal or greater." If you need to check "equal or lesser", try following combinations: "x>=0 x=0" or "x>=F x=F"
Let's say you want to make a program which jumps to label 2 if register x is NOT equal to MRF. The following program, "x=F GOTO1 GOTO2 LBL1", works just fine, but there is a better answer. With the following program "x=F x=0 GOTO2", you don't waste a label and can save a step. In this case, x=0 works as a 'short jump command.' Please note that this technique can not be applied if MRF is 0. When you want to check both MR01 and MR02 are equal or greater than zero, the following 4-step program works for you. "MR01 x>=0 MR02 x>=0" Similarly, if you want to check whether both MR01 and MR02 are zero, your program will be like this: "MR01 x=0 MR02 x=0"
[Advanced tips] Basically, the first condition and the second condition must be the same. But if the first condition involve the second one, then you may use this tip. For example, consider the following program. "MR01 x>=0 MR02 x=0"
This is similar to the above tip, but this time you would like to check if either MR01 or MR02 are zero. The above program should be slightly changed as "MR01 x=0 x=F MR02 x=0". MRF is arbitrary number but must not be zero. You may notice x=F in the above example is a 'short jump command' shown in the 'If not ...' tip. Please check the above 5-step program really works as expected. These 3-step commands are useful for range checking: "x>=0 x>=F x=F" and "x>=0 x>=F x=0". The first one is to check 0 <= x <= MRF and the second one for 0 <= x < MRF. Please check by yourself why they work. Some hidden characters shown by a normal ALPHA command. Quick way to load these programs into your FX-602P with FA-1: Enter Mode 3 INV LOAD P0(or any) EXE. Then start the MP3 file. This is a simplified Mahjong game for two players. Your opponent (FX-602P or 603P) plays on its own strategy without cheating (!). This program was first created in 1986 and updated recently. Enjoy! *Program is shown in a FX-603P type ASCII text format. Please ask if you find unfamiliar words. *Please visit here about the wav2bin converter program. Each player has 8 tiles randomly numbered from 1 to 9. A finishing hand must have 3 sets of Shuntsu (ex. 123) or Kotsu (ex. 555). A player draws one tile and then discard one in his turn. Then the other player does the same. A player can claim a finishing hand in his turn (Tsumo) or in the other player's turn using the discarded tile (Ron). Press EXE for Tsumo or 0 for Ron. The finished hand is evaluated according to its base and bonus. There are unlimited numbers of tiles, turns and games. ;-) Your average per game is shown. If you have a problem about following links, please let me know. I will fix or remove the link as soon as possible. Casio FX-602P - wav2bin(below) is a very nice program for FX-602P. Casio FX-502P Geek - Very COOL! Deep analysis & so much cool stuff. Caz Pocket Computers Collection - Great collections of pocket computers, including FX-602P and FX-603P. My new guestbook is here. I added a new link(Caz Pocket Computers Collection). Also, I have a new guestbook. I underestimated the risk of SPAM boming on my guestbook. :-< I will close the current and find a new one soon. I added FAQ about contrast, a new quiz, and a new link(casio fx-602p). If you know a key combination to change screen constrast of FX-602P, please let me know. A new link (Vintage programmable calculators) added. Added two MP3'ed programs which can display hidden characters. Sorry, these programs are for FX-602P & FA-1 (or FA-2) only. A new link (Casio FX-602P) added. Image of "Hidden characters" added. Another very cool site added. Thank you, FX-502P Geek! Oops, sorry for no updates for one year. I add a new link for a very cool fx-602p site. Thanks, Gilles! Added two programming tips from the original Japanese version. Quick translation from the original Japanese version. Sorry for translation mistakes! You may link this page freely. Informations and comments are always welcome. Please let me know!